Alyssa Gray and David Gray, aerialists and acrobats of Flying Dreams, perform stunning aerialist and acrobatic circus acts worldwide. Flying Dreams circus acts include wheel of death, aerial silks, doubles aerial silks, hand balancing, doubles hand balancing, acrobatics, aerial fabric, aerial rope, aerial straps, aerial tissu, stilts, vertical rope, variety acts, theme events and specialty acts. Flying Dreams was founded in 2002 when circus artists Alyssa Marx Gray and David Isaac Gray performed side by side at Tokyo Disney. It was there that the idea came into being of combining their aerial silks, straps and rope, as well as hand balancing and acrobat skills into one performance company, Flying Dreams. Flying Dreams circus artists consider all proposals for circus acts contracts of any duration. 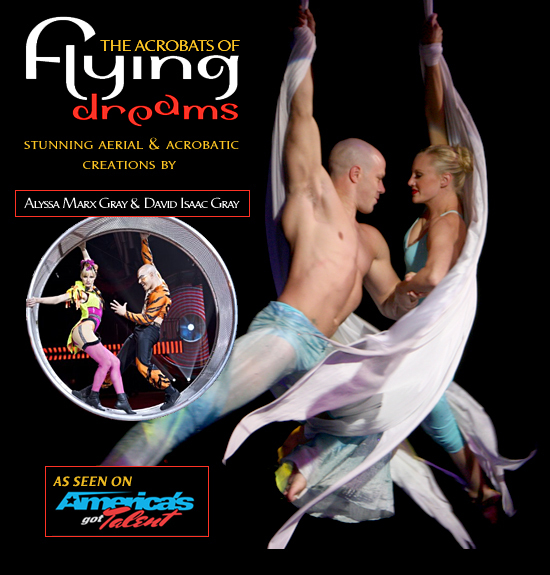 Visit our Flying Dreams website (www.flyingdreams.com) often for photos and videos of new aerial and floor circus acts.